Investopedia defines installment loans as loans that are “repaid by the borrower in regular installments . . . that include interest and a portion of principal.” By this definition, payday lenders that label themselves as installment loan lenders are being less than forthcoming. LoanNow offers real installment loans – why not experience the LoanNow difference for yourself? Installment loan lenders generally provide two types of loans: secured or unsecured. Secured loans are backed by collateral, while unsecured loans are backed only by the promise of the borrower to repay the loan. Unsecured loans are often called signature loans, because parties are bound by their signatures on the contract. Because they are secured by collateral, secured loans are often within reach of borrowers with fair or average credit. Examples of secured loans include mortgages and car loans, which are secured by the items being financed. Other installment loans are secured by collateral that is owned free and clear by the borrower, including precious stones, museum-quality artwork and cars or property that are unencumbered by loans. Secured loans can also be backed by financial instruments such as certificates of deposit or bank account balances. Installment loan lenders that provide unsecured loans often require borrowers to have excellent credit or a creditworthy co-signer to be approved. Payday lenders are a prominent exception. Their lending decisions are often based largely – if not solely – on the ability of would-be borrowers to demonstrate a reliable form of income. Payday lenders counter their lax underwriting standards by charging prohibitively high interest rates. Besides their lax underwriting standards, the factor many payday loans have in their favor is fast processing. Installment loan lenders like banks often force borrowers to wait weeks for lending decisions. Payday loans are processed within hours and often funded overnight. But Combined with the unrealistically short repayment periods for payday loans – including many payday installment loans – the terms for payday loans are downright predatory. 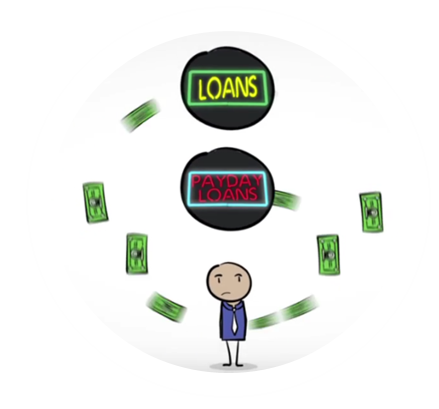 Desperate borrowers – many of whom have few or no other options for obtaining credit, are often trapped in a cycle of partial payments and rollovers that force them to pay many times more than they originally borrowed before they can close their payday loan accounts. LoanNow understands that when you’re faced with a financial emergency, waiting weeks for a lending decision just won’t cut it. We process applications just as fast as payday lenders. If you’re approved, you receive your money just as quickly as with a payday loan. But LoanNow is not a payday lender. Our loans carry manageable repayment periods that are comparable to those for bank loans. And we say no to rollovers that can escalate the amount that you owe. Why not experience the convenience and manageability of a LoanNow loan for yourself!